Basicks put out a new Bunker Hatch set to help your guys get into and out of those fortifications you've got on the table. Basicks has added new product to their Battlefield Resin Terrain line. 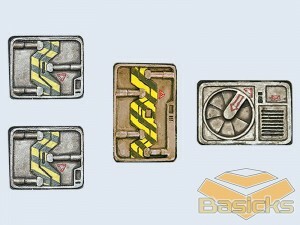 Bunker Hatch Set contains of 4 elements: 2x Hatch A, 1x Hatch B, 1x Door. It can be used in making of your own bunker.